Over on Open Exhibits, we’ve just released a new template called the Magnifier Viewer. 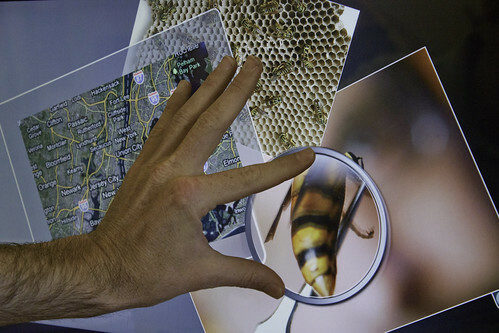 The template has an integrated multitouch-enabled magnifier object that can be used with a variety of media items such as images and Google Maps. We’ve been looking to integrate this magnifier into Open Exhibits and make it available to the community ever since we developed it for the California Mapping exhibit with Oakland Museum last year. The Magnifier Viewer has different styled magnifiers (round or square, brass or silver, handles or no handles) that can be changed via XML settings. This flexible template can be used to create a variety of custom exhibits. Just add media and customize the XML and you’re ready to go. This template and a dozen other software modules are available free on the Open Exhibits site. Museums, students, universities, and non-profits can get the Open Exhibits Core SDK for free too. Comercial users will need the GestureWorks framework to use the free modules. Open Exhibits and GestureWorks require Adobe Flash or Flex. We’ll be showing how to use this template and other software modules at an Open Exhibits bootcamp workshop next week at Museums and the Web conference in Philadelphia. Category: Adobe, Design, Exhibits, Flash, Flex, Gesture Works, Multi-touch, Open Exhibits.